Crusaders teammates Dan Carter (left) and Richie McCaw out-run downed Bulls players during a Super 14 semi-final in South Africa in May 2007 (which the Bulls eventually won, 27–12). Known as Super Rugby from 2011, the competition (originally called as Super 12) is the southern hemisphere's leading professional rugby-union competition. The number of participating teams rose from 12 in 1996 to 15 in 2011 (five each from New Zealand, Australia and South Africa). 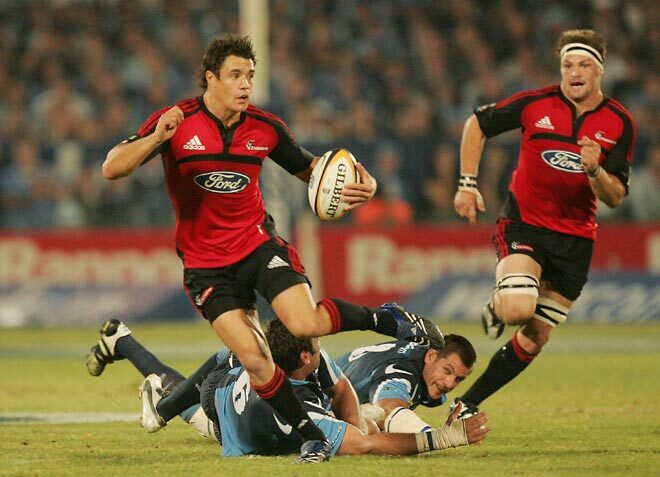 Carter, McCaw and five other members of the 2007 Crusaders were also selected for that year's All Black team.